Wait a minute didn’t I just do a post on flips!? Not soon after the PF flip did I come up with one of the best tasting flips ever! I call it my breakfast flip cause it has all the goodness of breakfast wrapped up into a cocktail! 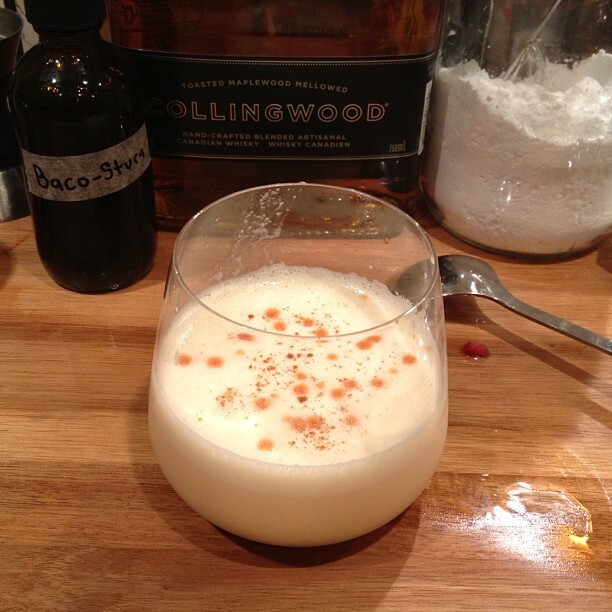 My favorite Collingwood Maplewood aged Canadian Whisky (which you can’t get in the states), Bacon infused Angostura Bitters, Egg, Cream, Maple Syrup , Powdered Sugar and topped with cinnamon. Tags: Angostura Bitters, cinnamon, Maple syrup. Bookmark the permalink. Previous post ← PF Flip cocktail -Did you just put an egg in my drink! ?